Thai satay sauce is a very popular Thai dish, it is eaten along with Thai satay sticks and is not a complete dish on it's own. Thousands of food lovers across the globe love Thai food, some of them even try their hand at making Thai food. But, few would disagree that Thai food is really very spicey and hot. In this section we talk specifically about satay peanut sauce, and discuss ways in which you could reduce the spicey and hot flavor of this Thai food dish. While doing this, we will ensure that the overall flavor of the dish is retained. Before we begin talking about satay sauce, we will need to make some very basic clarifications. You should not confuse satay sauce with another liquid preparation related to Thai satay, this is the satay marinate. While satay peanut is eaten along with pork, beef or even chicken satay sticks as a side dish, satay marinate is the liquid used to prepare the meat strips used to make satay. As the name suggests, the satay marinate is the liquid into which the meat is soaked prior to being cooked. Another side dish that is relished along with satay is called cucumber relish, pieces of cucumber are added to a special liquid preparation - delicious but different from satay sauce. If you have never seen satay sauce before, the above image will give you a great introduction to this very popular thai food dish. What you see in this picture is a piece of Thai satay, pierced with a stick and dipped in a bowl of delicious satay sauce. Many food lovers keep looking for an easy recipe for Thai satay sauce, and we will provide you the link to that at the end of this report. The texture of the satay sauce, is more like a gravy. One of the main ingredients in satay sauce is dried and roasted peanuts. You will not see peanuts in the image as, the ingredients are mixed together and blended in a food processor. You will now understand why this sauce is often referred to as satay peanut sauce. If you plan to make satay sauce, remember that both the names refer to the same dish. The Thais love their satay sauce hot and spicey, most Thai food dishes are prepared to excite the taste buds. An interesting thing is that many Thai desserts include crushed ice as an ingredient, a good way to put out those stomach fires from the fiery food. If you are a non-Thai or prefer milder food, it is always possible to work around and reduce the degree of fire and heat in Thai food dishes. This is ofcourse best done if, you cook your own Thai food. If you would like to moderate the taste of satay sauce, a slight change in proportions of ingredients used to make the satay sauce will be necessary. We will teIl you how to do this for satay sauce. The idea should ensure that the overall flavor of the satay peanut sauce does not change. In the case of this Thai food dish, the peanuts and red curry paste hold the key to your 'operation'. If you have looked closely at any Thai satay sauce recipe, you will notice that chillies are not added as a separate ingredient, and yet the dish has a stiff fire of it's own. The spice and 'hotness' of satay peanut sauce is given by red curry paste. If you are familiar with thai food, you will agree that thai red curry paste is a popular Thai food ingredient and is used in many famous Thai food dishes. 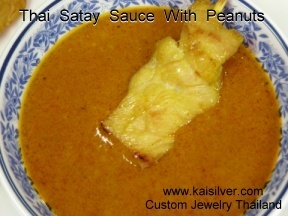 One way to moderate the heat in your satay peanut sauce, would be to reduce the amount of red curry paste that you add. This would allow you to reduce the spice. Another way to change the satay sauce recipe without affecting the flavor, would be to increase the amount of dried and roasted peanuts that you add. However you need to keep in mind that increasing the quantity of the peanuts, would also increase the quantity (volume) of peanut satay sauce that you end up making. If you think about increasing the sugar in your satay sauce recipe to moderate the spice and heat, you will most likely alter the flavor of the dish too. Adding sugar might also be a cause for worry if you are required to moderate the sugar intake in your food.